It is the ability to reflect or bounce high-frequency waves and produce echo. It is greater when the surface or medium responsible for causing this phenomenon reflects increased sound waves. In this type, there is a uniform echo texture that generally occurs when the medium has a smooth surface. Parenchyma is known to exhibit homogenous echogenicity. Elevations or lumps on the medium can give rise to mixed echogenicity. It is evident in the presence of liver and gall bladder nodules. Several kidney disorders can cause increased echogenicity. Renal cortex, which constitutes the outside portion of the kidney, is an important parameter in evaluating the results of ultrasonography. It can clearly demonstrate changes in the cortical structures. It is also called renal cortical echogenicity. In case of kidney stones, generation of very high-frequency waves indicates the presence of mineral deposits inside the organ. Increased diffuse echogenicity signifies a fatty liver- a condition marked by excessive accumulation of fat in the liver cells. Elevated levels of liver enzymes can enhance this process. It is also known as “hepatic echogenicity”. Pancreas is an endocrine gland, producing several hormones like insulin, glucagon, somatostatin and pancreatic polypeptide. Abnormal amount of fatty acids and calcium deposits makes the gland highly echogenic. 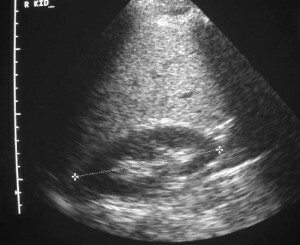 An inflamed thyroid can cause increased echogenicity. In radioiodine therapy, the presence of colloid nodules can be assessed with an ultrasound. The thyroid absorbs certain dose of radioactive element in this procedure to produce high echogenic response. Bones can cause bouncing of ultrasound waves, owing to their opacity. The fluid portion of the bone marrow is also capable of causing echogenicity. In certain ultrasound tests, gas-filled micro-bubbles agents are often injected into a patient’s systemic circulation. These minute gas bubbles possess a high degree of echogenicity. The phenomenon occurs when these bubbles get trapped in an ultrasonic frequency field, and begins to undergo compression and oscillation. A detailed image of the liver is obtained after the reflection of the ultrasound waves. The gas cores of micro-bubbles can precisely determine echogenicity. They mainly comprise of air or heavy gases such as perfluorocarbon. The dense gases are sparingly soluble in water and can cause decreased echogenicity. However, these gases leak out less from the micro-bubbles and remains in circulation for a prolonged period. Fluids like urine and digestive juices also show very high echogenicity that may aid in detecting abdominal and urinary disorders. Parenchyma is the functional part of some vital organs in the body. It forms the middle or central region of brain, heart, lungs, pancreas, spleen and placenta. The echogenic nature of parenchyma makes it highly reliable in diagnosing any minor or major defect in the structure of an organ. Stroma is the surrounding connective tissue that functions as the supportive framework of a cell, tissue or organ. Women suffering from polycystic ovary syndrome have small cysts in the ovaries that exhibit high echogenicity. 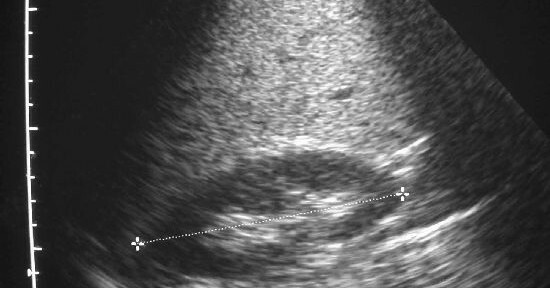 The strong reflection of ultrasound waves usually occurs due to the presence of ovarian stroma. The region around or near the ventricle of brain, heart and larynx called periventricular can produce echogenicity. It is highly useful in diagnosing malignant conditions of these organs. Formation of lumps or calcium deposits in the fetal abdomen can reflect high frequency ultrasound waves. These findings could arise from the liver, gallbladder, kidneys, adrenal glands, gastrointestinal tract and peritoneal cavity. Therefore, diagnosis of disorders associated with pregnancy and delivery becomes easier during an ultrasound check. This entry was posted in Acoustics on September 21, 2012 by Madhulima Acharya.